The Venezuelan news agency, Diario VEA, also weighed in saying “anonymous students planned on committing acts of destabilization” as the December 2 vote approaches. Venezuelan Radio Trans Mundial provided proof with a recorded video of a youth dumping gasoline into an armored vehicle, ramming metal barricades into police on top of other vehicles, and knocking them from their roofs and hoods onto the ground. 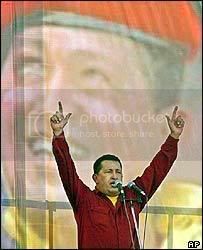 Chavez has widespread popular support throughout the region and from allies like Ecuador’s Rafael Correa and Nicaraguan President Daniel Ortega who expressed his “solidarity with the revolutionary people of Venezuela and our friend Hugo Chavez, who is being subjected to aggression from a counterrevolution fed by the traitors from inside the country and by the empire (referring to the US).” He compared the situation to his own country where similar efforts are being “financed by the United States Embassy” in Managua to support elements opposed to his Sandinista government even though it’s very accommodative to Washington. • enacting social security protection for the self-employed. • one relating to the country’s territorial organization; plus others on education, a shorter workweek and more democratic changes. Point of fact – Venezuela and Argentina have the highest growth rates in the region and are near the top of world rankings in recent years. Following the devastating oil management 2002-03 lockout, Venezuela’s economy took off and grew at double digit rates in 2004, 05 and 06 and will grow a likely 8% this year. Hanke, however, says “Venezuela’s economic performance under Chavez has been anemic (growing) at an average rate of only 2% per year. In the same article, he aims in similar fashion at Ecuador’s Rafael Correa calling him “ruthlessly efficient (for wanting to) pull off a Bolivarian Revolution in Ecuador.” Hanke and most others in the dominant media are of one mind and never let facts contradict their opinions. Outliers won’t be tolerated even when it’s proved their way works best. There’s lots more criticism like this throughout the dominant media along with commentators calling Chavez “a dictator, another Hitler (and) a threat to democracy.” Ignoring the rules of imperial management has a price. This type of media assault is part of a prelude for what often follows – attempted regime change.